This week the media has concentrated on the new darling Twitter Internet IPO. Twitter began the week with an IPO target price of $17 to $20. It then raised that estimate to $23 to $25 before raising it again to $26 where it will launch this morning. Did the company see a massive growth in profits over the last 72 hours to justify the price surge? No, the CEO this morning said it was due to the number of people that recognized the Twitter brand during his road show this week. I am not making this up. It was raised solely due to hype, mania and madness. What kind of profits can the swarms of investors that pour into the market today to buy the stock expect? None. It has no profits. This has been the new trend of IPOs this year, with 61% of companies coming to the market that have lost money in the preceding 12 months. That is the highest rate since the peak of the last tech mania in 2000. The graphic below shows a Twitter valuation of $11 billion with no profit. That was so last week. It has now crossed $18 billion. What a show. What are the companies doing with the money provided during the IPO? Most respond that they are paying back private equity investors that bought in early rather than invest in the expansion of operations. Information like that gets glossed over during a mania, however, as the smart money that bought in early cashes out and the masses are led to the trough for what is left. The market excitement has moved beyond Twitter and the technology sector to sweep the entire U.S. stock market which crossed new all time record highs during yesterday's session. The Investor Intelligence bull to bear ratio is at the second highest point since the cyclical bear market rally began in March of 2009. The only higher reading occurred in April of 2011 when the market fell 22% just a few weeks later. To find a higher reading before that moment you would need to go back to October 2007 just a few weeks before the market peaked and fell over 50%. 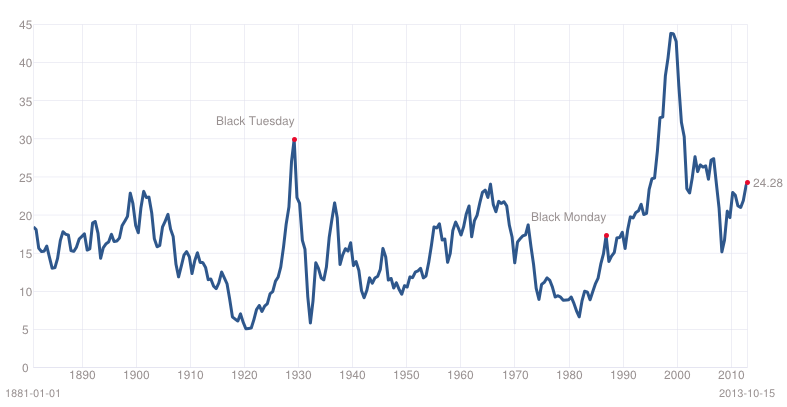 Shiller's CAPE P/E ratio has crossed over 24 and is rapidly closing in on the 25 mark. 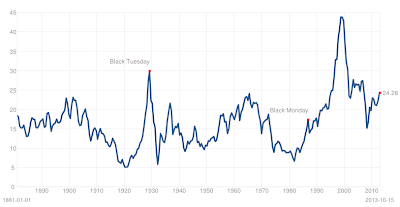 Hitting the 25 point is interesting because as the chart from Bespoke below shows, we can look at how money has performed over history when investing at a P/E ratio of 25 or above. 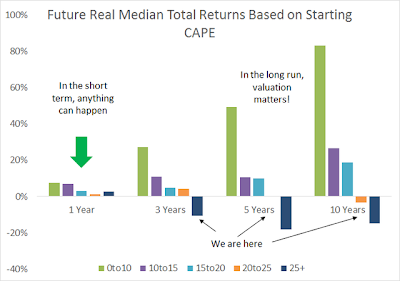 While you may be lucky and catch the continued momentum in year one, a longer term investor has been slaughtered when investing at these valuation levels over a 3, 5 and 10 year period (dark blue bar below). 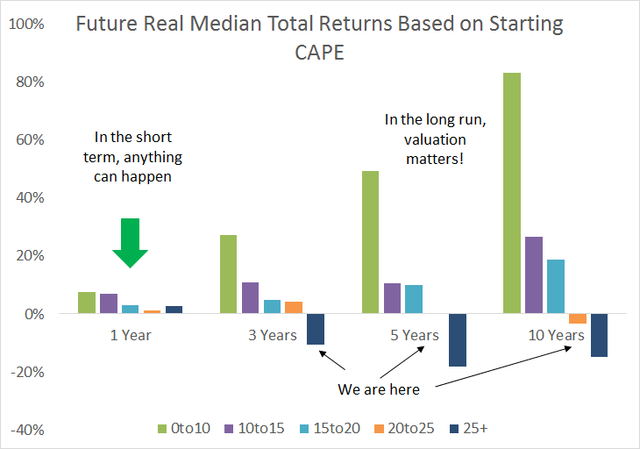 The time to invest is when stocks are the most hated, when P/E ratios are under 10 (green bar below), which occurs at the beginning of secular bull markets (see graph again above). The madness gets even crazier delving further into specific indexes. The top 50 companies in the Russell 2000 now have a P/E ratio over 45. This means it will take an investor 45 years to earn back the money they have invested today. That is of course unless the P/E ratio doubles again and they can sell to a greater fool tomorrow, which is what everyone is counting on. 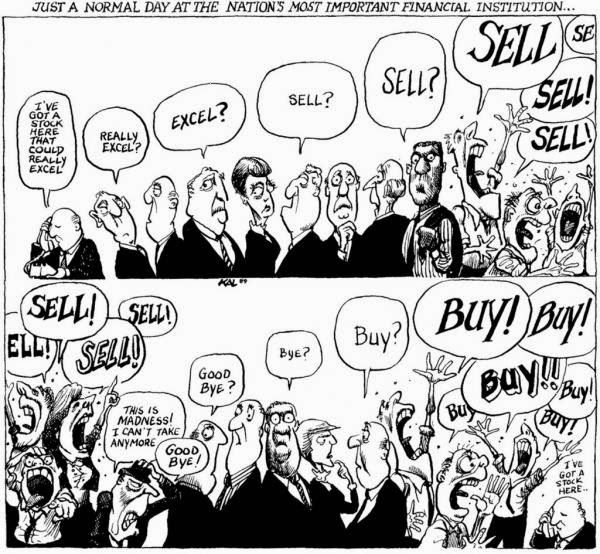 I think the following perfectly sums up the rationality toward buying and selling the market today. We can only hope that the same fundamental reasoning used for buying today is not used on the sell side tomorrow.